Forgive me, but I am going to do just that. So, if no other blog posts appear after this, you'll know that my pride did me in. But May has been a good month. 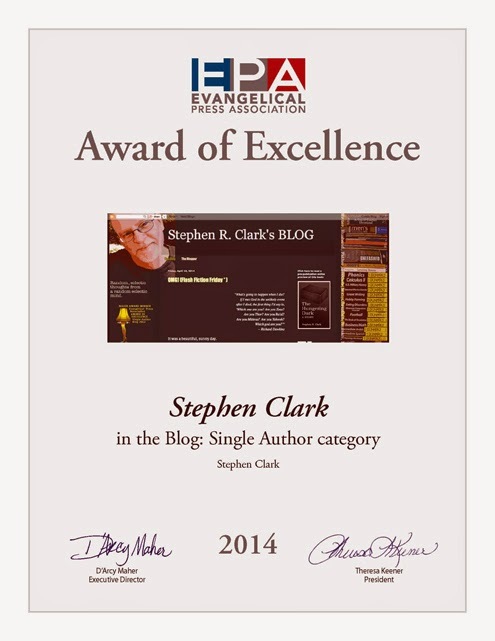 First, just over three weeks ago I learned, via a Facebook post, that I'd won first place in the Blog: Single Author category of the Awards of Excellence from the Evangelical Press Association (EPA)*. I won the same award two years ago. You can read about that here, “This is really something!” What I said then still applies today. In truth, it is humbling and a real honor to receive recognition from my EPA peers. My heartfelt thanks goes out to all involved in judging the contest entries. You can view the full list of winners here, Awards of Excellence, and here, Higher Goals Awards. Congrats to all the winners! Second, over the holiday weekend, the total views for this blog edged over 50,000, and the number of views continues to climb at a brisk pace! While this doesn’t necessarily mean my blog posts have been seen by that many people, it does mean that this blog has a wide reach. Knowing this is also humbling. My prayer is that all those who visit and read are blessed as well as enlightened and, yes, even entertained. To all who stop by FaithBraised™.com and read, thank you! If there are topics you’d like to see addressed here, please let me know. If you disagree with something I’ve written, sound off! I’d love to hear from you. *FYI: The EPA is a professional association of some 300 Christian magazines, newsletters, newspapers and content-rich websites from throughout North America. EPA's purpose is “to strengthen evangelical periodicals through inspiration, instruction, and networking.” I’ve been a member since the 80s. What do you think of my blog? Do you stop by frequently? Is this your first visit? Do you like the “scrolling format” as pointed out by the judges? Anything else you especially enjoy or despise? Share your thoughts in the comments! Honey, I shrunk the God! And now I really need a crash helmet. A funny thing happens to God on the way to the movies. Or TV. Or into our lives. This big and small screen deity is often adorable, warm, cute, clever, funny, offbeat, clumsy, ornery -- pretty much un-God-like. Instead of the Creator of the Universe, he might be portrayed as a crusty old sailor named Stumpy who thumps from bar to bar spouting off salty and questionable wisdom based on his thorny life experiences. Or, as in many sci-fi movies and shows, the “god” character is always oppressive or mean or demanding or controlling -- all things that seem to annoy the humanoids, whether earthlings or Time Lords, who stumble onto this “god” creature. Instead of the God to be embraced and worshiped, he is a “god” to be exterminated, contained, or pitied. Frankly, I have no problem with God creating the universe with a big bang -- I can just imagine Him snapping his fingers and, Bam! there it is, stars and sprites forever. It takes a big God to make a vast universe. Regardless of whether he is shown as warm and fuzzy, vicious and malevolent, or hilariously clueless, these representations of “god” all have one thing in common: they diminish God, shrinking him down to fit the sketch or storyline needs. Our personal “god” is often made after our own image. You know, someone more relatable and cool. Or, maybe a jolly, giving Santa Claus in the sky. Many of us love our coffee. We take it in various formulations depending on our mood or needs at the moment. If we’re tired, we order a venti, strong, with a shot or two. Maybe tamed with some cream and sugar. If we want something tasty, we may order a caramel latte with whip, or a pumpkin spice with a dash of cinnamon. Whatever our state of mind, whatever our moment’s desire, there’s a coffee creation for that. Sadly, we view God in a similar fashion. A transcendent God is the opposite of what we often try to settle for: a de-capped lowercase “god,” diminished and dismissible; a small cup of weak decaf coffee to go, made to order. We love to talk and sing about the big, big, gigantic love of God. It’s comforting to envision our Big Daddy in the sky. Or maybe, he’s more like a rabbit’s foot or a talisman we keep in our pocket; a good-luck charm to bring out when we feel the need. Give it a little rub for luck then tuck it away. Okay, grace, mystery, and majesty are all good. We’ve got hymns for those. But, Oh, the precious wrath of God? Doesn’t seem like a good song title. But it is the truth. It’s easy to yawn in the presence of a saccharinely sweet lovey-dovey, de-fanged “god.” But this is not the God of the Bible. When times get tough, a god in our pocket is pointless. Dyck’s book does an excellent job of reminding us of Who it is we, as Christians, claim to serve, and for others, reveals the dangerous God being snubbed. Yawning at tigers: You can't tame God, so stop trying is reminiscent of J.B. Phillip’s little classic, You’re God is too small. Dyck tackles similar themes found in Phillip’s book in a fresh, contemporary, and accessible manner. Drew Dyck, the author and managing editor of Leadership Journal, has given us an excellent, well-written, yawn-stifling book that deserves a wide audience. It’s broken out into two parts with six chapters per part. To help us reclaim a true sense of the God who is there, Dyck first leads us through the “Tiger Territory” of the more ignored aspects of His wrath, holiness, and face-planting awesomeness. Then, we are brought back to God’s “Divine Embrace” as we re-learn the tenacious, lion-like tenderness of God. There’s an included discussion guide that makes the book very useful for small group study. The notes section points to additional resource material for those who want to dive deeper. But hang on as you read. After reading Dyck’s book, I’m thinking crash helmets and life preservers should be standard issue for all of us as we stand, live, and worship in the presence of a great, holy, and all-loving tiger-fierce God. In his book Dyck says, “Ultimately, when it comes to God, we’re like ants crawling across an iPad: in touch with something we only faintly understand.” Do you agree? Disagree? How do you experience God in your life? Share your thoughts in the comments! Recently my wife, BethAnn, and I were up in Ann Arbor, Michigan to visit her daughter, Mallory, a doctoral student at U of M. Our visit coincided with the 36th annual Ann Arbor Antiquarian Book Fair, so we decided to check it out. There was a $5 cover charge to get in, so the experience, from the outset, was totally unlike browsing through books at a thrift store, or even in a Barnes & Noble. The “ballroom” in which the fair was staged was not large and was crammed with 40 or so “booths” bearing books, comics, posters, prints, and other related items. At one booth, I was stunned to see a copy of John Updike’s book, Rabbit Run, sitting there nonchalantly with an $850 price tag laying on it. While not a scholar, I am an Updike fan, and own nearly all of his books, many of them as first editions. Rabbit Run was originally published in 1960. However, my copy is an old, worn pocket paperback version. It cost me 95 cents and bore the 1970 movie tie-in cover. The movie -- which starred James Caan, Carrie Snodgress, Anjanette Comer, and Jack Albertson -- was semi-loathed by Updike. Updike, who died in 2009, is considered a notable contemporary American author and all but a couple of his books are still in print and widely available. It was a little jarring to see one of his titles commanding such a high price. Why does that doggy in the window cost so much? “What makes it worth $850?” I asked the man manning the booth, interrupting his banter with a chum. “Well, duh,” I thought to myself. All of this I knew or assumed. But still, eight hundred and fifty clams? I pressed him gently, asking if there was more about the book that merited the XXXL pricing. He explained, somewhat impatiently, that he’d sold copies in better condition for more money, and in slightly less good condition for less money, and that this copy was clearly worth the $850. Needless to say, I didn’t buy the book. I’m content with the copy I own. Unless they were available on Amazon, of course. I momentarily did seriously consider buying a copy of Buchanan Dying by Updike that another seller had in his booth. It was, also, in good condition, etc., etc., a hardcover, originally priced at $6.95, and now available for a mere $60. Buchanan Dying is a play by Updike, originally published in book form in 1974. Being as this was a smaller print-run title than most of Updike’s books, and one I don’t own, I was a little interested. I was able to talk the buyer down to $48, but still couldn’t bring myself to make the purchase. After all, I could find a perfectly good copy online for around $10, including shipping. Valuing books is a tricky business. That hardcover copy of Rabbit Run originally had a list price of $4 in 1960. That means the publisher actually sold it for only $2, and from that $2 John Updike probably earned less than 10 cents. Today, a brand new trade paper copy of Rabbit Run runs around $16, list. Once a book is sold once, the author never sees any more money from its resale. And unsold, overstocked copies of Rabbit Run, or any book, then and now, are remaindered by the publisher for pennies on the dollar. Authors seldom make any money on remainders even though remainders get resold. You can tell a book that’s been remaindered as it will be marked by the publisher, usually with a wide felt marker stroke on the bottom edge. This makes them non-returnable. It also generally renders the book uncollectible or at least minimizes its collectible value. Often, too, the pages and covers of remainders, while touted as “like new” in some resell stores, will bear some yellowing or other tell-tale signs of age or slight wear. While you may be paying “half price” for a “like new” book in a discount store, you’re really paying more. “I write to be collected, not read,” said no author ever. I visited the website of the Antiquarian Booksellers’ Association of America to learn a little more about the trade. They have an 8-part mission statement explaining their raison d’être. While there’s a stated intent to foster good relations among its membership and the expressed desire to increase interest in collecting and preserving old books and associated materials, something was missing. And, it could be said, with these we fill books and from the books we read and fill our minds, and this cycle continues the earth turning, continues lives being lived. Wash. Rinse. Repeat. Or, rather, read, read again, read more, and write on. As I’ve mulled my visit to the book fair, I’ve wondered who the buyers of collectible books are. Certainly not, at least primarily, readers? The great irony is that, apparently, many get into the trade because of their love for reading books, but then the books they buy and sell are not for reading. A well-read book does not a collectible make. The copies of Updike’s books I own, while many are first editions, are not unmarked, but bear the loving bruises of having been handled, hauled around, and engagingly read. Meaning I tend to underline passages and jot notes in the margins of nearly every book I touch. That’s one reason I’m not a fan of libraries. They don’t like when you do that to their books. And I guess that’s why I could never be a collector of antique or rare books. Collecting means you obtain and display, and perhaps resell. But you don’t use. Let loose the cracked tomes! As I’ve thought about the books trapped in those fair booths, I’ve daydreamed about becoming an antique book anarchist, stealthily traversing the country, bound in leather mask, rechargeable power drill in hand, breaking into antique book fairs at night, drilling holes in the books, rendering them uncollectable and fit only for the thrift stores, but not unreadable. Kind of like breaking into a zoo and letting out the animals, which could be less dangerous than freeing books to be read. I don’t believe he was complaining that there are too many books, but rather that keeping up with all the knowledge that was fit to print can be exhausting. While a collectible book may command a high price, the real value isn’t in the book as an object, but in the words inside them getting inside you. After we wearied ourselves at the Ann Arbor Antiquarian Book Fair, we refreshed ourselves with a visit, first to a gelato shop, and then to a nearby used-book store where, for about $12, I obtained two books to add to my abundant collection of well-read and soon-to-be well-read treasures of sweet, tasty grammar and lexicon. Now, does anyone have a rechargeable power drill I could borrow, indefinitely, no questions asked? If money were no object, would you collect rare and old books? Something else? How many books do you own? How many ebooks? Which do you prefer, ebooks or print books? Have you ever been caught off guard with the realization that you are actually hard pressed to define a word that is totally familiar to you? You kind of know the concept evoked by the word, but nailing down the specifics of its meanings is suddenly elusive? While you may think you’re having what many call a brain fart, you may actually be on the cusp of insight and epiphany! The word that caught me up short recently is grace. But then an angel tapped me on the brain and I started thinking about what it means. The Holy Spirit does move in mysterious, and sometimes annoying, ways. Grace is an elegant concept tied to pardon, mercy, forgiveness. It is unmerited favor; receiving something we don’t deserve instead of potentially rough justice we've earned. If marriages were more grace-filled there would be far less divorce, which is too often a very ungracious and selfish choice. When grace comes to us from God, it is entirely unmotivated by anything we do or say or are. All we can do is actively accept it, or actively or passively reject it. This is the side of grace that ties in most closely to forgiveness. For me, a visit to the dentist is a very peaceful and reflective time; until I see the bill and what I have to pay! There is no way of knowing exactly what this “thorn” was. If Paul meant “flesh” as in his actual physical body, it could have been a chronic illness. Some believe it was a recurring and painful eye affliction. In fact, if Paul meant “flesh” in a spiritual sense, this opens the possibilities even wider. It could have been a particular temptation that he struggled with on a regular basis. Whatever it was, the thorn was sent to him, as Paul states, to keep him humble; so maybe his struggle was with pride. We don’t know. Then today I was reading in Mark and came to where Jesus says that we need to become like children (Mark 10:14-15). A child is utterly dependent upon their parent’s grace, in every sense of the word. That helps clear things up some. But not completely. I’m still pondering and trying to get an even clearer understanding, as well as a better experience, of God’s grace. Are you? What does grace mean to you? Have you experienced God's grace? How about grace from anyone? Do you regularly extend grace to others? What does grace-doing look like? Share your thoughts in the comments! (This is an interview I did with the Schaeffers in 1982. See "behind the scenes" information below*. Well-known as authors, lecturers and out-spoken philosophers, the Schaeffers have a lot to share about their books and their beliefs in this interview by Stephen R. Clark. Between the two of them, the Schaeffers have penned 30 books which have sold over 3,500,000 copies in the U.S. alone, and have been translated into as many as 21 languages. Not a bad record for two people who never planned to be writers, and who never refused an opportunity to minister. What motivated you to start writing? What was your purpose? FS: I had no intention of writing any books, no intention whatsoever. I had a lecture which I gave on speaking historic Christianity into the twentieth century. I gave it at many universities in Europe; Oxford, Cambridge, etc. Then I came over and I gave it at MIT and Harvard. And as I gave this lecture, I refined it. I always had discussion, I like discussion very much. If I saw that things were not clear, or could be improved or even if I’d made mistakes, which everyone does, I would then repair and strengthen it. So then, at each place the lecture built up into something more clear. Then I gave it at Wheaton College. And when I gave it there, they asked if they could put it out in booklet form. I made them promise not to give general distribution to it other than for their own student body, because I really, even up to that time, never had any intention of using it as a book. But when I saw it in that off-set form, I saw that I had something. And I felt, then, a responsibility to make it into a book. I could see that it would be a useful book I experimented, and that became The God Who Is There. It just grew naturally out of the general work in the lecturing. So then, each successive book was more or less out of a series of lectures? But then How Shall We Then Live was entirely different. I simply sat down and worked at it, along the idea of the book and a film. Now that you see your complete works published by Crossway, how do you feel about that? But the thing that impressed me, as I said, “Well, I’ll try,” is that when Jeremy Jackson and Randall McCulley both fed me ideas, and I went over to look at their ideas to see what I thought the books needed for bringing them up-to- date and improvements...we realized that, really, every one of the books, including the earliest one, was more contemporary at that time than when they were written all those years ago. Because then, they were ahead of time. And now we were right there. So the thing that has been my chief reaction is that of real hope that they will be very much used for the ‘80’s. Mrs. Schaeffer, why did you start writing? How did you get caught up in all of this? ES: I had no intention of writing anything either, but it happens to be that it was five years before my husband wrote his first book that I actually wrote the L’Abri story. But it was not published for five years. My beginning of that book took place because of a friend who insisted that I had to write this story myself. That nobody else could write it. She offered to give me a month’s money— and she didn’t know how she was going to live that month — to go to a hotel and “write some lovely stories.” At first I replied in the negative, saying that it was impossible. I couldn’t leave the kitchen, and I was needed, and soon. Then, suddenly, things dropped into place. My husband was asked to speak in America for the first time in some years, and he decided that the Lord would have him go. He said, “Why don’t you write that book while I’m gone?” At the same time, a girl who had been greatly helped in L’Abri offered to do a month of cooking, and my children, Deborah and Franky, agreed I should go. And suddenly, on the tenth day, I sat down and started out, and I wrote. I wrote 21 days and got 19 chapters done. When I was done I carted it back home, and went to meet Francis in London. Then it was taken by Tyndale House, and I wrote a twentieth chapter, five years later...and that was my first book. Now, each book has come about in a different way. But I never started out on my own. Each book was asked for by a different individual and I was really shoved into it...not against my will, but I sort of caught fire because somebody else lit the match arid waved it around. Something that comes through your writings is the great sense of family that you two have developed, which is a very rare quality today. How do you do that? Do you have any secrets to share? ES: It’s just that we have made lots of mistakes. And we would not put our selves as — and I even hate the words — role models of how the perfect family should be run. With that being said, I would say that it takes a great deal of working at it. And I am thrilled to find my own children doing the same thing with their children. Such a thing as careful time, a certain amount of time each day unless it’s totally impossible, is vital. It takes reading with them, vacations when no one else is with you, certain amounts of time alone so that you spend time becoming a family rather than just sharing it. I’m not saying that we did it perfectly, but it takes fighting for certain times alone; for privacy, and considering your children as important as other people. And I would say that this is where my husband shone. Also Fran’s answering the children’s questions individually. Susan had that in her book, that she remembers an instance from when she was about 12 or 13, and she said ‘I don’t believe in God’ and so on, and her father’s quiet and careful dealing with her questions as if she were 23, instead of as young as she was. I feel we must treat children as people, as human beings. If a three year old is going to be your friend for the rest of your life he’d better have memories of your seriousness...you don’t know when a child’s first memory is going to be. And it isn’t that you’re perfect every minute, but treating your children as human beings pays off. And no two personalities are alike. You can’t lay down a law as to how to treat each child. Children are different, and they need different kinds of attention, different kinds of help. You need to be sensitive, praying for help. Ask the Lord to give you new ideas for this child who is three and who isn’t like the first two. As time goes on, I think you need time set aside for just family. Our family reunion is the most looked forward to part of the year. Everyone sets aside their five days. Franky is a movie maker and a busy young man, but boy, that five days is precious. That will not be encroached upon by anything else. Whether it’s money or time, they put it aside so that we can all be together. What do we do? We sit there and discuss everything. There is a tremendous variety of subjects, and to get through it all is a hard thing. And then we need to listen to the grandchildren’s’ latest activities. FS: A sort of goal, in thinking about children, is to realize that you don’t have them very long. You don’t realize how quickly the time passes. So you have to take the time, you have to really work at it while you have them. Then you will have them forever. You still have a parental relationship with the children, yet, at the same time, as quickly as possible, you work not to just dominate them but to let them be people as people, feeling themselves, with out them feeling that you’ve dominated them in a bad sense. So they come to you for advice. So that at a certain period, you become brothers and sisters in Christ. ES: I’d like to add to what Fran has said, in that I feel that all along the way one’s attitude should be that of expecting to learn something from the child. Not feeling as if you’re always on a pedestal, speaking down to your child and then suddenly he comes to a point where, maybe, he knows enough to sit down and have discussions. But really having your ears open to the wonder of children. I think that kind of attitude of seeing through the child’s eyes some thing of the wonder you’ve either lost yourself, or never had because you were not the individual your child is, is important. That attitude of listening has got to be there. FS: That’s not only true of children, but it’s true in working with people. I think the Lord gives gifts to people, and what I think has been most helpful to me is that, as people come to us from all over the world, and from many, many disciplines, is really listening to them as well as just talking to them and lecturing them. As I listen to most Christians talking to non-Christians, what they do is lecture. They never listen. They’re not talking right to the place where the people are. They’re just giving them formulas. But the second thing is, very often, they’re missing a tremendous opportunity to learn. Getting back to your writing...do you feel that there has been a recurring or predominant theme in what you’ve had to say? FS: In talking about our books, and how they began, you must see that they formed one unit. The first books were very much ground breakers in the area of dealing with the Christian’s under standing of, and their dealing with, the problems raised by our music, cinema, philosophy and so on. I’m not saying that others hadn’t written on them, but in the evangelical, or fundamentalist or the “Bible-believing” roots of people, there wasn’t much dealing with this. So the books were pretty revolutionary. I would express it as the Lordship of Christ in the totality of life, rather than a small area. A rejection of the platonic spirituality. The other books, then, grew out like spokes from the wheel, from that basis. I went from dealing with the Lordship of Christ in the area of art and music, cultural and intellectual things, to His Lordship in the area of government and law. And then when Dr. Koop, Franky and I worked on Whatever Happened to the Human Race, we carried this a step further, expressly dealing with the place where a relativistic set of morals and arbitrary law and humanistic medicine came together at the point of human life. Now, again, I had no intention of writing the Christian Manifesto. It never entered my mind. But as we had the seminars across the country, more and more people raised the question, “If these things are as prevalent as you say they are, then what is the Christian’s attitude towards government and even disobedience?” Again, this was revolutionary because most people had never thought of it. They just assumed that the Christian obeyed, period, paragraph. And you must realize that the first of these books was written in, I think, 1967. So only a relatively few years were spent in writing them. But, on the other hand, none of them has been written in a year or two. They have represented years and years and years of not only individual thought, but of answering questions in the hottest seat you could sit in, in Universities and so on across the world. FS: Well, actually, I have to think of this very practically. What you are asking me is not a question that I haven’t thought through. And I always begin the same place. It’s the place that has made it possible for our whole family to live with this. That is emphasizing the reality of the fall in an abnormal world. Not just as a theological position, but really living in the light of the fact that we live in an abnormal world. Very often I find one of two reactions from people. One is, why has God done this to me, how could a good God let this happen. The other would be what have I done wrong that I have cancer. But I think either of these are faulty questions if you accept the reality that we live in an abnormal world. When I found that I had cancer, naturally I didn’t like it. It wasn’t good news at all. But on the other hand I wasn’t surprised. Because we live in an abnormal world we all have all kinds of things that go along with us. I don’t believe for a moment that God gave me cancer. I think I have cancer because we live in a fallen world in which the whole cause and effect is out of joint, up to the level that we all know we are going to die. So even if you believe in healing – and I do believe God can heal in answer to prayer – you have to recognize that we live in the midst of a fallen world and we are not to be surprised that there is such a thing as death. Or, in this specific case, cancer. Now then, you can turn this around and you have Romans 8:28, “All things work together for the good of those that love God, to those called according to his purposes.” But I think this is often misunderstood, and applied wrongly so that becomes destructive. It is applied as though, in a kind of magical way, things will work out for the good. So spirituality becomes having this plastic smile on your face and everything is great, even when it isn’t great. Because all things work together for the good. But if you read the context and totality of Scriptures, something very different comes across – that we live in an abnormal world. I have cancer, but nevertheless God is so great – He is infinite – that He can reach down in the midst of the abnormal mess and bring something good out of it. Once you look at it this way, the whole thing changes. The whole perspective changes. In my own case, if I could wave a wand and get rid of my cancer, I would wave it in a second. Because going through all this chemotherapy 12 days out of every 20 has its rough spots. But God has a right—and now we come to a crucial step-God has a right to put me where He wants to put me in the midst of the battle. I am a total supernaturalist. I believe in the battle of the heavenlies. My cancer, the cancer of others, may have something to do with the battle of the heavenlies. And if God is my God and He is the one I say He is, He has a right to put me in the midst of the battle. I can see, in my own case, remembering al ways that I would get rid of the cancer if I could wave the wand, nevertheless there have been thousands of people who know me through my books and so forth, who have been encouraged because Francis Schaeffer has cancer. He hasn’t been healed completely, quote, unquote. And yet, he is going on in the midst of the battle and is being productive. So I can see the good that has come out of it in my case. You do a lot of traveling and lectures, and speaking engagements. Why do you take on so much? FS: I very much feel that it’s a crucial day that we live in. And I never speak on subjects just to speak on them. I’ve got a fire in my bones about these things, because I really do believe that we’re aw fully far down the road and we need to speak with courage. I feel somebody must lecture on these things, and not just drift down the road. Somebody has to say, “Now, wait a minute.” The Christian answer should not be taken for granted to be a driftwood-pacifism and a soft view. If anybody asked me what the biggest problem among those of our age, I am 70 now, at the moment was, I would say it is having the wisdom of the Lord to know what we should say yes to, and what we should say no to. Switzerland is our home, and left to ourselves we would just prefer to stay there more. And yet I feel, we both feel, that we are working on the cutting edge. That being so, we have our responsibility to ask the Lord what he wants us to do...even though left to ourselves we would prefer to spend more time back in Switzerland. So we are in Switzerland about two-thirds of the year, and traveling for about one-third of the year. *On this day in 1984, Franis Schaeffer passed away after a long struggle with cancer. I was reminded of this after stumbling across On Francis Schaeffer by Bruce Little. Above is the interview I did with them two years prior. Oh, what a sophomoric interview! I met the Schaeffers and did the interview in Dallas, Texas during the summer or 1982 while attending my second CBA Convention as the editor of Christian Bookseller Magazine. I had read most of Francis' books and was in awe of the opportunity to meet him and Edith. For reasons that still are not clear to me, when it was time to go to their hotel for the interview, I chose to take the bus from the convention center. I guess it seemed the economically responsible thing to do, but a taxi would have been a much better choice. It was about 80 or 90 in Dallas and the bus didn't seem to be air-conditioned. And then, I got a little turned around and had trouble finding the hotel. I was late, hot, and sweaty when I arrived. Their publicist met me in the hotel lobby and hustled me up to their room. Now, keep in mind, this was before cell phones, digital cameras, or chilled bottled water were ubiquitous. The only technology I had with me was a small cassette tape recorder. When I got to the room I fumbled my explanation for being late, apologized humbly, and tried to hide the fact that I was soaked under my sport coat. However, I couldn't hide the thick sheen of sweat on my forehead, and pretty much all over my face. To my amazement, Edith fussed like a mother hen over me. She got me a clean hand towel to wipe my face, profusely apologized for not having anything cold to drink, but did offer me some chilled fruit. Francis sat, somewhat impatient, until we were all settled. But he was gracious and kind as he answered my lame questions. In fact, I asked one that was completely off the mark -- I apparently confused him with someone else -- yet they both gently worked through my clumsiness. This was a stark contrast to an experience I'd had trying to do a phone interview with Henri Nouwen who abruptly hung up on me when he decided I hadn't read his books and so had no business talking to him. I guess everyone has bad days. At any rate, we concluded the interview and I made my way back to the convention center. Later, again with graciousness, they autographed several copies of their books that I had brought with me. Edith added whimsical drawings of mountains and birds to illustrate her message and signature. I still have those books. Including the 5 volume set that was the point of the interview. My goal is to get a fresh set (now available only in paperback) and re-read them. Why a fresh set? For two reasons. First, during a move the box they were packed in got wet and the books suffered water and mold damage. Second, I'd like to read without having to read around my old notes and underlining. Schaeffer's writings have had a significant impact on shaping my own thinking on faith and culture. I cannot recommend his books highly enough. He was a good man and his voice is missed. I was honored and humbled for the opportunity to meet both he and Edith. Have you read anything by Francis or Edith Schaeffer? Have a fond memory of an encounter? How have their writings impacted your faith? Please share your thoughts in the comments section! My Mom’s name is Grace. Growing up, in church, we always sat in the same place: On the right side, on the end, three rows from the front, right behind another Grace. I was surrounded by Grace! Grace was always near at hand. As we know, kids minds work weird (mine especially so, and even now still) so every time we sang a hymn that contained the word grace, I used to think we were singing about the two Graces somehow. I mean, who wouldn’t? Every time Amazing Grace came up, which was fairly often, it tickled me and I’d chuckle. Then I’d get smacked. Not too hard, just enough to remind me I was in church and that meant being quiet. But still I chuckled while we sang. And so did Mom and Dad, though they tried to hide it, because they knew why I was chuckling. I was cute then and cracked them up with stuff like that. The sound of this was not so sweet. But once those words of unwelcome promise were uttered, a lot of negotiation, pleading, and downright bribery went on—appealing to Grace—before Dad got home. Fresh picked wildflowers from the woods across the street often had a great soothing effect and seemed to erase Mom’s memory. Not always. But usually. And when it worked, that to me, was real grace! When the flowers and child’s charm didn’t work, the words, “This is going to hurt me more than it’s going to hurt you,” just seemed to add insult to the injury I was about to receive. The injury was more in my mind than on my behind, but it’d still hurt. Discipline was supposed to be a form of mercy, but it didn’t feel merciful. It kinda stung and burned a bit, if you know what I mean. It’s taken a few years to understand that, in fact, the grace applied to my backside truly was merciful, and truly was a grace of sorts. Part of that realization came the first time I had to spank my son. That did hurt me worse than any spanking I’d ever received. But my intent was to apply the grace of discipline that would yield obedience and character in my son. When God disciplines us, I believe it also hurts Him worse than it hurts us. After all, His love for us is perfect and infinite, and He desires us to be holy. He loves us more than our moms. So, we have amazing grace. How sweet the sound! Because it does save a wretch like me, and like you. God’s grace is free, but not wimpy. It wasn’t won cheaply, nor is it applied cheaply. To His children God applies it aggressively and lavishly. Aggressive grace can sting, whether applied in discipline or as cleansing. Besides wildflowers, the woods also had small streams that were more like small muddy rivers when it rained. Okay, so can you guess what me and my little neighborhood buddies would do when that happened? Yep. We played in the water… and the mud. I’d come home covered, head to toe, in mud. What’d Mom do? Simple. She’d hose me down. The water was cold and the pressure stung. But, once again, that was grace. Living in this world is like slogging through the mud. Daily the dirt of life and the sins of our stubborn flesh can cake us, head to heart, in spiritual mud. And when we come home to Him, God hoses us down with the washing of His grace. After the hose, out comes the scrub brush of holiness and the lye soap of Jesus’ blood. His love is never-ending, His mercies are new every morning. Our spiritual skin may get rubbed a bit raw in the process, but it always feels good to be clean. I miss my Mom, and my Dad; they were good people. I included this as part of the eulogy at my Mother's funeral; you can read more here if you're interested. How do you view God's grace? What memories do you most cherish about your mother? Please share your thoughts in the comments! At an early age Edward discovered the uncanny ability to foresee certain aspects of the near future. The first time this happened he was sitting quietly listening to friends having a discussion and knew what each was going to say before they said it; kind of like an echo; he heard them first in his head and then just moments later speaking the exact words out loud. The effect was fascinating and frightening, as well as a little annoying. It didn’t happen all of the time but came and went without warning. However, it never extended past the near, almost immediate, future. For example, on his birthday he had to feign surprise as he opened his gifts since, as he unwrapped them, he knew exactly what each one was before he had the packages fully opened. Just an hour earlier he was totally clueless as to what he would be receiving. Over time as he grew older he learned to somewhat manage the phenomenon. But he never really got used to it. Most of the time he wished he didn’t know what was about to happen. He had no concept of what it was like to experience a real surprise. The last thing he ever foresaw was how he would die. Then he did. What happened next he never saw coming; it was his first ever complete surprise. Flash fiction is nothing more or less than a very, very short short story. Not counting the title, this one clocks in at 228 words. I wrote this on the spote years ago as a creative exercise during a meeting of a writer's group. What do you think surprised Edward, in the end? About eight years after its release, I finally read the business bestseller, Good to Great: Why Some Companies Make the Leap...And Others Don't by Jim Collins. The book came out in 2001, but didn’t interest me at the time. In a conversation with a pastor friend, Ken Cavanagh, he referenced the book, and the context of that reference tipped me into choosing to finally read it. I’m glad I did. The examples of this were all too familiar, such as situations where new leaders are put into place, and in order to put their imprimatur on the business, they toss out everything started by their predecessor and set off in new directions. Can’t you just see the entire organization hitting the wall? Ouch. Constantly shifting direction, changing priorities, starting and stopping and restarting not only damages, de-motivates, and demoralizes the people involved, but also wastes money and time. It hurts the companies, organizations, or projects on many levels. But too often, these costs are never counted or recouped. While there are times when making a radical shift is the right choice, it should never be done on a whim. There must be compelling reasons to make the change. If not, then hold steady. I think there’s a spiritual application here as well. The year before Collins’ book came out, A Long Obedience in the Same Direction: Discipleship in an Instant Society by Eugene Peterson was released. The title says it all. While we do need to regularly assess ourselves and make a clean break with anything sinful that lingers in our lives, for the most part, we must hold steady to the Rock and maintain our course. Just for fun, here are some keywords from Good to Great that help paint the picture of successful endeavors: interlocking pieces, integrated, patterns, simple, coherent, methodical, momentum, deep understanding, consistent, disciplined action, sustaining, cumulative, iterative, diligent, quiet, deliberate, process. Oh, and what was the context of the comment by my pastor friend that intrigued me? It was related to a key personality quality shared by leaders of great companies. But more on that later. How important is it to hold steady in business or in life? What do you think the character trait is that I hinted at in the last paragraph (Hint: I've posted more than once on the topic.)? If you've read either of the books, share your thoughts on them in the comments section. I loved my Mom’s chili. It was the perfect accompaniment to her grilled cheese, or vice versa. Both the chili and the grilled cheese she made were basic, nothing-fancy recipes. The sandwich was made with white Wonder bread and Kraft “cheese product” slices. And the chili was made with Brooks chili beans. The chili recipe probably came from the side of a can of the beans or, possibly, an issue of the Ladie’s Home Journal, pre-1952. Years ago, while living alone in New Jersey, I got a hankering for her chili, so called and got the recipe. The only question I really had was how much chili powder to use. I think she said around a tablespoon, but I found this to be inadequate and always added more than that. The macaroni was optional, made on the side to add to the chili, giving it more substance. With or without the macaroni, I could eat her chili all day long. I never had just one bowl. Not too long ago when the snow was still flying (Just yesterday?) I decided I wanted Mom’s chili. Finding everything I needed was pretty easy except for the beans; it took awhile to track those down. Most stores seem to carry everything but Brooks brand beans. Well, here’s the thing. I like to get creative and “improve” on her recipe, adjusting a jot here and a tittle there. Know what I mean? First, instead of plain tomato juice I might get V8, maybe even the spicy kind. Next, perhaps I’ll experiment with different kinds of chili powder. Then, maybe I’ll add fresh crushed garlic and throw in some hot Italian sausage with the beef, or even add some chopped up green bell peppers. Sometimes the result is pretty good. Sometimes not. But, every time I mess with the recipe, I’m a little disappointed because it’s not Mom’s chili! Even though I’m craving her chili, instead of just trusting and sticking to her recipe, I get creative and miss the mark. I should learn better already! A friend once commented on Facebook that she thought the Bible needed to be updated or edited because certain parts seem old-fashioned and out of date. I’m sure there are many who agree with her. In other words, we want the benefits of God’s blessings, but perhaps, we think, we can make how we live out faith a little better than how He prescribes in His Word. You know, hold the obedience from time to time, spoon in some juicy gossip, let in a little greed here and there, substitute faith with works, slip in a dash of lust, or add just a pinch of cheating, lying, or jealousy. Surely God is good, but with a little tweaking, we could make Him better, right? The problem is that when we mess with God’s law, by either taking away or trying to add to (as in legalism), things tend to go awry. Just as when I mess with my Mom’s chili recipe, the results aren’t as good. David declared, “Oh, taste and see that the LORD is good! Blessed is the man who takes refuge in him!” (Psalm 34:8, ESV). The writer of Hebrews encourages and warns us stating, “Jesus Christ is the same yesterday and today and forever. Do not be led away by diverse and strange teachings.... ” (Hebrews 13:8-9a, ESV). The best way to enjoy and serve God is straight up, no leaven, taking Him at His pure organic self. The Lord is best and good as is. There’s no expiration date on His love, either! “But as for you, continue in what you have learned and have firmly believed, knowing from whom you learned it and how from childhood you have been acquainted with the sacred writings, which are able to make you wise for salvation through faith in Christ Jesus. All Scripture is breathed out by God and profitable for teaching, for reproof, for correction, and for training in righteousness, that the man of God may be competent, equipped for every good work” (2 Timothy 3:14-17, ESV). When it comes to living a godly life, the best recipe is to believe in the God who is the I Am, and follow the Bible He gave us, no additives, tweaking, substitutes, or editing needed. Now, I just need to apply this truth to my Mom’s chili recipe! It’s making me hungry just thinking about it. Is there a recipe you play with and then wish you hadn’t? Are there parts of the Bible you wish would just go away? Can you empathize with my example above? Share your thoughts and experiences in the comments! across the expanse of the heavens.'" Yes, I'm not a great poet and I know it. Still, I'm trying, experimenting, writing, and putting it out there. Are you? Please let me know what you think of my attempt. Any suggestions for improving it? Are there other verses of Scripture it brings to mind? Share in the comments! Coloring Wrong: Part 2 -- It's all God's fault! In my previous post, I denounced education and all associated with it. While everything appearing in that post about my bad fourth grade experience up to the heading “‘Education’ is a bunch of hokum” is true, what came after is not. So what’s the real point I’m trying to walk you to? Everyone has bad experiences in life. We get hurt by people and by organizations. We encounter bad bosses, cruel colleagues, fake friends, and more. We discover what we thought was our dream job is really more of a nightmare. Or, we have a great job we get laid off from. Relationships fail for innumerable reasons. Groups we try to associate with turn us away. Parents let us down. Friends betray us. And, probably most tragically, some feel that God is a mean phony. After reading my experience with my fourth grade teacher, I doubt if anyone would point to “Education” as the problem. However, if an experience like that had happened in a Catholic school or an Evangelical church or some other faith-based context, I can assure you the outcry against Christianity would be thunderous. God would be blamed. Christianity condemned. By this logic, given recent developments, the NBA (and possibly the NAACP as well) should be dismantled instead of Donald Sperling merely being banned. There are many examples of bad teachers, whether incompetent, lazy, or misguided, and yet no one blames “Education” as the problem. Very rationally we know that these are instances of individual bad, even evil, behavior. Even when there’s an issue in a school, we know that the right solution is to ferret out those individuals who are responsible. We do not throw the baby (Education) out with the bathwater (a few bad apples). And no one denounces U.S. Secretary of Education, Arne Duncan, for a local school issue or teacher failure. Well, no one who is rational. But if even only one priest or pastor fails us, or one church fumbles and is perceived to cause someone harm, we are quick to irrationally label ALL believers, ALL churches, ALL Christianity, ALL religions evil. And, of course, God is nothing but a miserable miscreant. To hell with Him! That bumbling bully hurt us! Because of the personal nature of faith, when we’re hurt here, the blame is big. But there’s more than a little bigotry, and irrationality, at play in all of this. The truth is that anything good misused can have bad outcomes. Tragically, damage has been done in the name of Jesus, Christianity, and religion. However, the reality is most damage that touches us isn’t done by “the church” or “the faith” or by Jesus, God, or the Holy Ghost. Just as in my example with my former teachers, the damage is inflicted by imperfect sin-proned people acting out of wrong-headed, selfish, greedy, or warped intentions. Or maybe they’re just having a really bad day. Even good people can cause us hurt. Frankly, a lot of damage has been done the same way by people in the name of liberalism, conservatism, atheism, communism, consumerism, truth, justice, and the American way. In fact, damage has been done in the name of rock and roll, tattoos, healthy eating, veganism, and just about any “cause” or “philosophy” you can imagine. People get hurt by well-intentioned and not-so-well intentioned doctors, NBA team owners, lawyers, garbage collectors, waitresses, police officers, politicians, relatives, clerks, customer service agents, gas station attendants, artists, musicians, athletes, and others all the time. And, yes, we can be hurt by teachers and pastors as well. Fortunately, many teachers I encountered before Mrs. Aker and after did not do as much damage as she. Yes, some flubbed it now and then, such as the sociology teacher I mentioned. For the most part, though, I had really good to great teachers. Many I have thanked more than once for their positive influence and encouragement. I owe them and admire them. I also have friends and relatives who are teachers (including my wife) for whom I have deep and genuine respect. I also believe strongly in the value of a good education. Just because there are teachers who do bad things, that doesn’t mean Education is something to be rejected or labeled as evil. And, likewise, just because you’ve been hurt by a church or someone claiming to be Christian doesn’t mean faith or Christianity is something to be rejected or labeled as evil. Despite the adage, one bad apple does not have to spoil the barrel. If you’ve experienced hurt within the context of faith, I’m really truly sorry. I can relate to being abused by brothers and sisters in the faith. I know what it feels like. I’ve been lied about and lied to, slandered, misunderstood, falsely accused, and misused by fellow believers. And, more sadly, there are times when I’ve done stupid and hurtful things back. I thank God for grace and forgiveness. We all need these all of the time from Him and each other. And I’m thankful that, for the most part, I've been able to separate faith from the fault. I don’t blame God for the bad choices someone else made. I know God is there to help me heal from the hurt that was inflicted. Walking away from God at times like these only allows the wound to grow worse. There have been deep woundings where hanging in with God was more difficult and took some time. In those times I lashed out at God and pushed Him away. And in these especially hard times I’ve learned that He can take my lashings, He never goes very far away, and the healing starts when I let Him back in my life. Whenever I’ve experienced a slight at the hand of someone I thought was a fellow believer, instead of writing off all of Christendom, I’ve stopped to think about what was happening. I try to get to what’s causing their bad behavior. I seek to discern their motivation. Did they do what they did or say what they said intentionally to harm me? Was it an accident? A slip of the lip? An instance of them being clumsy? A poor choice of words? Or perhaps I just misunderstood. Confusion can be cleared up. Definitions can be agreed to. An accident can be excused. But if in seeking to understand it becomes clear that there’s ill-will behind another’s words or actions, that’s a definite red flag (More in this in a moment). I seek to discern if this is a reoccurring issue. If this isn’t the first time an issue has arisen, then I try to look for a pattern. Perhaps we are at odds in our thinking or believing and we just need to avoid certain topics; we can agree to disagree. Perhaps there’s a difference of personality styles that’s causing clashes. If this is a one-time instance, it can probably be addressed and moved on from. If not, it may mean moving away from the other person. I seek to discern if I’m the problem. This is the hardest one. It could be that I’m being stubborn, biased, or blind. There may be something I need to look at and adjust in myself that’s causing me to react to others in a negative way. If I’m not willing to change, how dare I confront others about how they rub me the wrong way! I’m still working on getting this one right, because I always want to be right, know what I mean? Writing people off when we’ve been hurt opens us up to be written off when we hurt others. This merely leads to a cycle of despair. Better to forgive and move on than to reject and rot. There are those times when moving away from someone is truly the only choice, especially when they are choosing to embrace and embody evil. Years ago I experienced great pain at the hands of someone very close to me who was supposed to be a Christian. In fact, we both came out of similar church backgrounds. The hurt was vicious, recurring, and more than a little confusing. In fact, it’s persisted for years. I shared what was happening with a godly and wise friend who listened and then suggested I read M. Scott Peck’s book People of the Lie: The Hope for Healing Human Evil. He pointed out that some people are just evil. This was a shocking revelation to me. While I accepted that there were “bad” people in the world, I had never wrestled with the idea of evil people in the church. But, even Jesus warned, “Beware of false prophets, who come to you in sheep’s clothing but inwardly are ravenous wolves. You will recognize them by their fruits” (Matthew 7:15-16, ESV). Paul also laid it out plainly saying, “For such men are false apostles, deceitful workmen, disguising themselves as apostles of Christ. And no wonder, for even Satan disguises himself as an angel of light. So it is no surprise if his servants, also, disguise themselves as servants of righteousness. Their end will correspond to their deeds” (1 Corinthians 11:13-15, ESV). As I began to evaluate the situation in light of this new insight I was able to see and, with tears, acknowledge the evil in the heart of the other person. It was and still is a heartbreaking realization. I forgave them and moved away from them. It was the only response that was healthy. But I did not move away from God, faith, or church. Isaiah describes a misused Jesus explaining, “He was despised and rejected by men; a man of sorrows, and acquainted with grief; and as one from whom men hide their faces he was despised, and we esteemed him not” (Isaiah 53:3, ESV) . If anyone can relate to what it’s like to be hurt by others we thought we could trust, it’s Jesus. While Mrs. Aker failed me and what she did hurt me, it was her individual sin that was to blame. It wasn’t the school’s fault. It wasn’t the Board of Education’s fault. It wasn’t the U.S. Department of Education’s fault. It was her fault. And I know God liked my drawing! If you’ve been hurt by a person of faith, don’t blame God for their freewill-driven stupidity. If you’ve been hurt in church, don’t blame all of Christianity for that church’s freewill-driven failure. Most Christians are pretty good people. Most churches are great places to be involved in. Open your heart so the healing can begin. The rejected, betrayed, crucified Jesus invites you, saying, “Come to me, all who labor and are heavy laden, and I will give you rest. Take my yoke upon you, and learn from me, for I am gentle and lowly in heart, and you will find rest for your souls. For my yoke is easy, and my burden is light” (Matthew 11:28-30, ESV). All I’m saying is give His peace a chance. Now, get your crayons and let’s color! Have you ever had bad experiences with Christians or churches? How did you recover? What advice for healing can you share with others? Share your experiences and thoughts in the comments!